This woman might very wells have to pick out drapes for her jail cell. 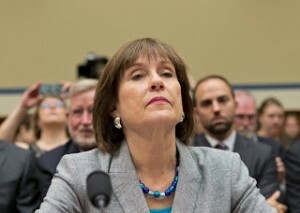 Washington Times reports Lois G. Lerner, the woman at the center of the Internal Revenue Service scandal over special scrutiny of conservative groups, specifically targeted tea party applications and directed that they be held up in 2011 in order to come up with an agency policy, according to several of Ms. Lerner’s emails released by a House committee Thursday. In one 2011 email, Ms. Lerner specifically calls the tea party applications for tax-exempt status problematic, which seems to counter Democrats’ arguments that tea party groups weren’t targeted. “Tea Party Matter very dangerous,” Ms. Lerner wrote in the 2011 email, saying that those applications could end up being the “vehicle to go to court” to get more clarity on a 2010 Supreme Court ruling on campaign finance rules. In another email, from 2012, Ms. Lerner acknowledges that the agency’s handling of the tax-exempt applications had been bungled at the beginning, though she said steps had been taken to correct problems. What I don’t understand is why the GOP House committee investigating this matter is taking so long to get to the bottom of the scandal.